Topology is a global aspect of materials, leading to fundamental new properties for compounds with large relativistic effects. The incorporation of heavy elements gives rise to non-trivial topological phases of matter, such as topological insulators, Dirac and Weyl semimetals. The semimetals are characterized by band-touching points with linear dispersion, similar to massless relativistic particles in high energy physics. The interplay of symmetry, relativistic effects and, in magnetic materials, the magnetic structure, allows for the realization of a wide variety of topological phases through Berry curvature design. The Berry curvature describes the entanglement of the valence and conduction bands in an energy band structure. 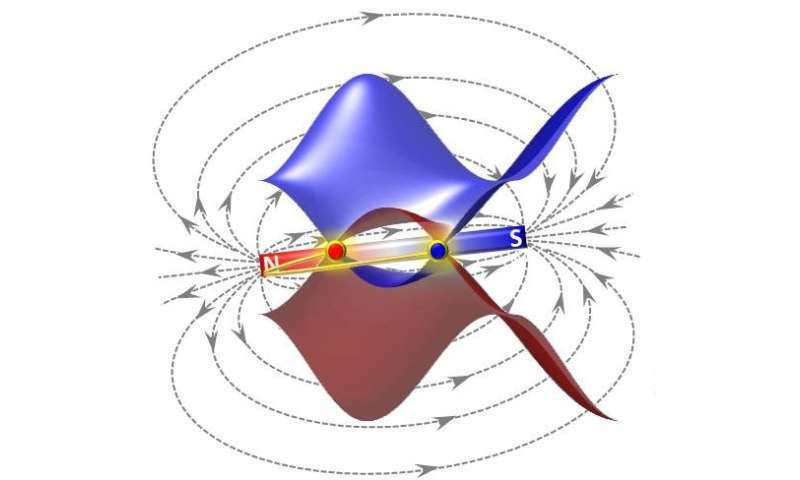 Weyl points and other topological electronic bands can be manipulated by various external perturbations like magnetic fields and pressure, which results in exotic local properties such as the chiral or gravitational anomaly and large topological Hall effects, concepts which were developed in other fields of physics such as high energy physics and astrophysics. Weyl semimetals require broken inversion crystal symmetry or time-reversal symmetry (via magnetic order or an applied magnetic field). So far, no intrinsic magnetic Weyl semimetals with Weyl nodes close to the Fermi energy have been realized. In the recent study, scientists from the Max Planck Institute for Chemical Physics of Solids in Dresden, in collaboration with the Technische Universität Dresden, scientists from Beijing, Princeton, Oxford, and others found evidence for Weyl physics in the magnetic shandites Co3Sn2S2. The family of shandite crystals contains transition metals on a quasi two-dimensional Kagome lattice that can give rise to magnetism. 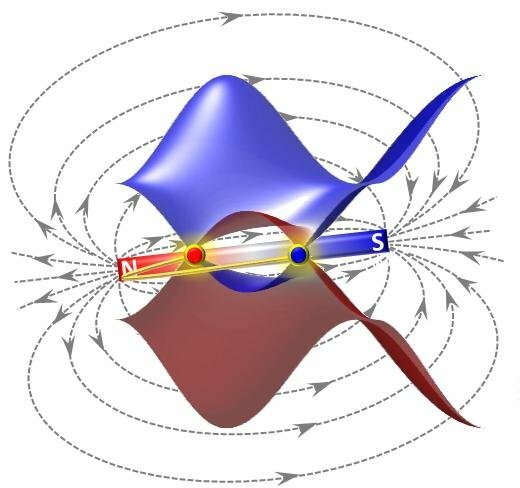 One of the most interesting is Co3Sn2S2, which has the highest magnetic ordering temperature within this family and in which the magnetic moments on the Co atoms are aligned in a direction perpendicular to the Kagome plane. The observation of the quantum anomalous Hall effect at room temperature would allow for novel computing technologies including quantum computing. To realize this possibility, our strategy is (i) to search for quasi two-dimensional magnetic materials with topological band structures and (ii) to synthesis these materials as monolayers or very thin films. However, so far no magnetic materials are known, which could lead to higher temperature quantum anomalous Hall effect. In order to obtain large Hall angles, namely, the ratio of the Hall to the electrical conductivities, two conditions must be satisfied: firstly a large Hall conductivity and secondly a small number of carriers. These conditions are met in Weyl semi-metals where the Weyl nodes are close in energy to the Fermi energy. We have found that Co3Sn2S2 displays a giant anomalous Hall effect and a giant hall angle at temperatures of up to 150 K, suggestive of a Weyl semimetal. Subsequent band structure calculations indeed show the presence of Weyl nodes close to the Fermi energy. Moreover, magnetotransport measurements give evidence for a chiral anomaly that is a clear signature of a Weyl semimetal. Our work provides a clear path to the observation of a quantum anomalous hall effect at room temperature by exploring families of magnetic Weyl semimetals. This study, for the first time, realizes the giant anomalous Hall effects by using a magnetic Weyl semimetal, which establishes the magnetic Weyl semimetal candidate Co3Sn2S2 as a key class of materials for fundamental research and applications connecting the topological physics and spintronics. With a long-range out-of-plane ferromagnetism on the Kagomé-lattice model for the platform of quantum topological states, we further expect that this material is an excellent candidate for observation of the quantum anomalous Hall state in the two-dimensional limit.